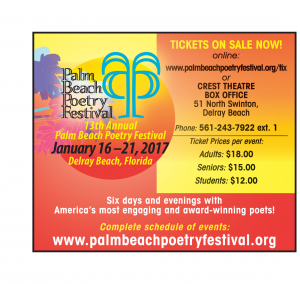 Palm Beach Poetry Festival Tickets for events featuring America’s most engaging and award-winning poets are on sale now! For a Complete Schedule of Public Events, and to order tickets, visit Old School Square, Crest Theatre Box Office, 51 North Swinton Avenue, Delray Beach, FL 33444, or call 561-243-7922, Extension 1, or you may purchase tickets online. Individual Event Ticket Prices are: $18 General Admission, $15 for seniors, and $12 for students. Student Group discounts available for groups of ten or more. Service charges apply for tickets purchased online.